What's all the Fass about? 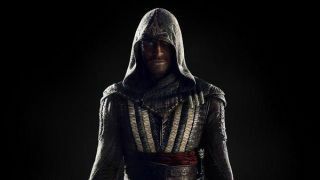 A new poster for next year's Assassin's Creed movie has just been "revealed", giving us our first glimpse of Michael Fassbender in the iconic getup. Well, a CG version at least - there's no way this is actually him in costume, right? What we're most likely looking at here is a photoshop that tells us little beyond that - yup - that's Fassy in the AC outfit, and he's going to be doing some assassinating. The movie is out next December and will see Fassbender playing the role of Callum Lynch (a character that has been created just for the movie) who discovers he is a descendant of the secret Assassins society and then starts reliving the adventures of his ancestor Aguilar, in 15th Century Spain. The film will be set in the same world as the games, so perhaps we can expect to see some more familiar faces. Faces that look a little less digitally enhanced, we hope. Also, here's the face of TechRadar's John McCann on the same poster. We did this one in about three seconds. If any studios are interested, he's available for screen tests.